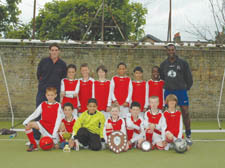 YOUNGSTERS from Chapel Football Club have set their sights on winning even more silverware next season after being crowned champions in the Under-9s South Division of the Camden and Islington Youth League. The successful soccer stars were presented with their trophy this week as they celebrated becoming one of the youngest teams within the club to win a major title at Market Road. Despite topping the league on goal difference, Chapel shared the Under-9s championship with rivals ‘A’ Class after the two sides finished the campaign with identical records, consisting of 11 wins, two draws and only one defeat from their 14 games. The triumphant team rounded off an impressive season for Chapel, who also won the Under-13s Challenge Cup and finished as runners-up in the Under-11s ‘B’ League. The celebrations continued on Friday when footballers from Islington Admiral Youth gathered for the club’s end of season awards ceremony. Admiral were one of the most successful clubs to compete at the artificial pitches, winning a league and cup double in the Under-12s Division, capturing the Under-10s ‘B’ League title and finishing as runners-up in the Under-13s ‘B’ Division. Among the star players was Reece Crean-White, from Kentish Town, who was named managers’ player and the players’ player of the season for the second year running. There were also top awards for midfielder Kane King, who was voted the most committed player of the season, and Viney Chohan, who won the supporters’ choice award. Admiral have enjoyed such a successful season that the club have announced plans to launch two new teams this summer, which will compete in the Under-8s and Under-10s League. Anyone interested in joining the club should contact Steve White on 07949 435 926.